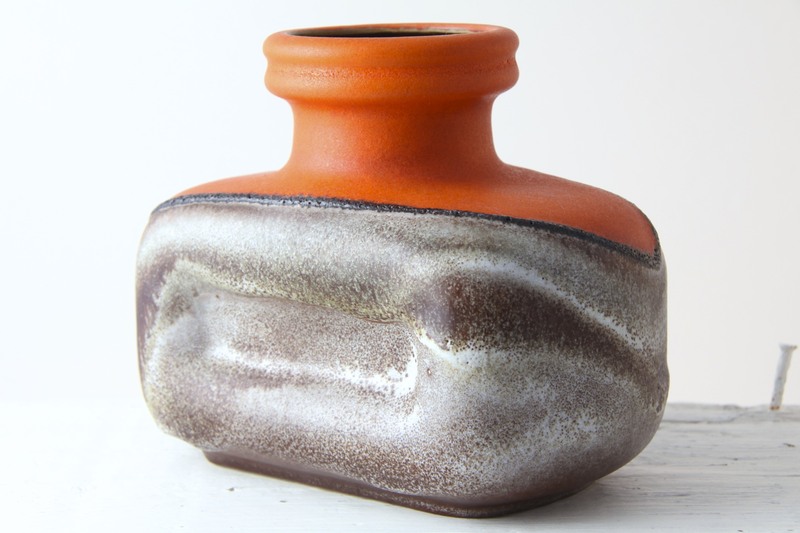 Large Scheurich Keramik handled vase, West Germany, 1960’s. This is a Lovely Large Scheurich Keramik handled vase, West Germany circa early 1960’s. 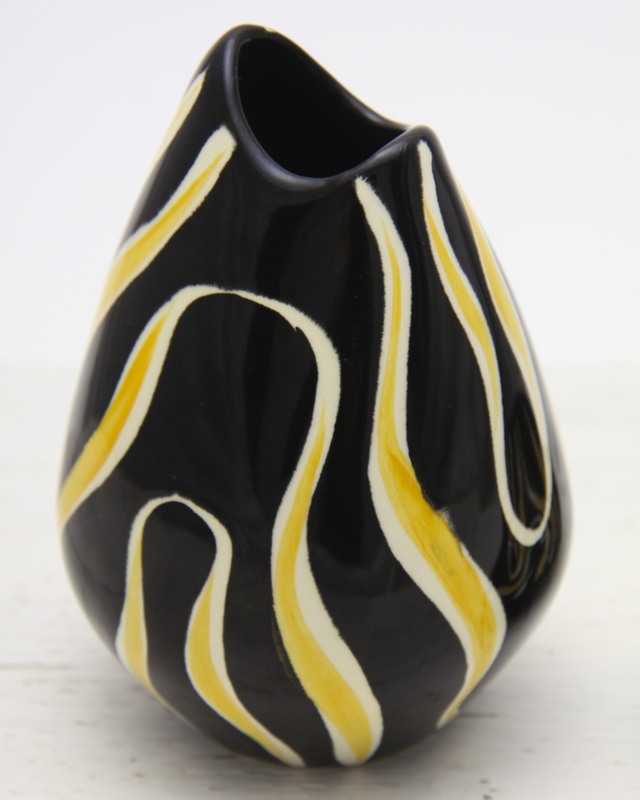 A Stunning form and decor on this vase by Heinz Siery, the main designer from the mid 1950’s. With its conical bulbous base, large chimney like neck and right angled handle it has beautiful proportions, possibly based on classical styles and adapted for the mid century era. The glazes are fantastic, a foamy base in a light yellow / green, pumice like and very similar to ‘Fat Lava’ glazes. Embellished with abstract geometric ‘Cubist’ style motifs in a black glaze. Some using the ‘sgraffito’ technique to make incisions in the surface, these are filled with vibrant orange and blue pools of glaze. The interior is glazed in a bright glossy yellow. Very reminiscent of the mid century modernist era, similar to designs by Marcello Fantoni in Italy at the time. Possibly referencing the same Etruscan classical styles, interpreted for the modern age. 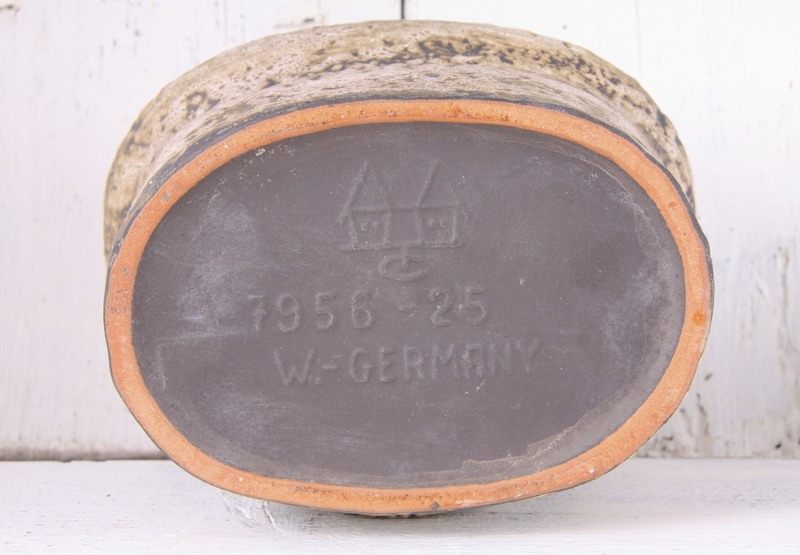 Would be Great as part of a collection of West German / Fat Lava / European Art Pottery, and would make a fantastic addition to any retro, vintage, 50’s, 60’s, mid century, modernist, minimal or contemporary interior. Moulded mark to the base 285 40. Measures 40 x 18 x 18cm / 16 x 7 x 7in. 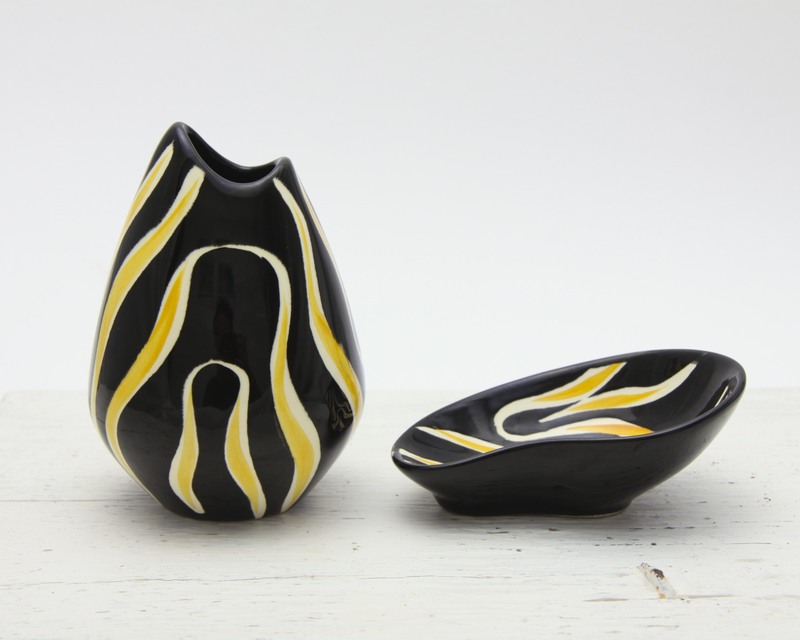 These are a Beautiful miniature vase and dish pair, made by Zell Schmider Keramik, West Germany, form and decor designed by Anneliese Beckh circa 1956. 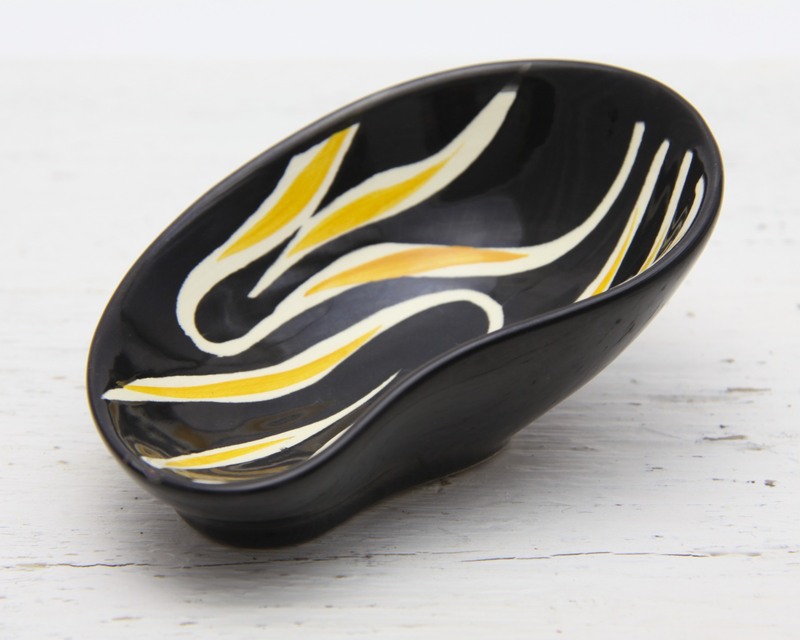 In the Stunning ‘Tigris’ decor, with its glossy black glaze and wavy stripes in yellow and white. Very reminiscent of the era and most likely influenced by Picasso, Cubism and Modernist styles, understated, elegant and classic design. Lovely forms, the small vase having a rounded tapered body with a curving rim and the pin dish sits at an angle with an asymmetric curved kidney shape. Both perfect as part of a centrepiece or grouping, as a single stem vase and pin dish, desk accessories, or sculptural pieces in their own right. Pieces from this lesser known pottery are rarer than the output of the large ceramics factories of the 60’s / 70’s, and this earlier Mid Century style is very collectable as an antithesis to the ‘Fat Lava’ styles. 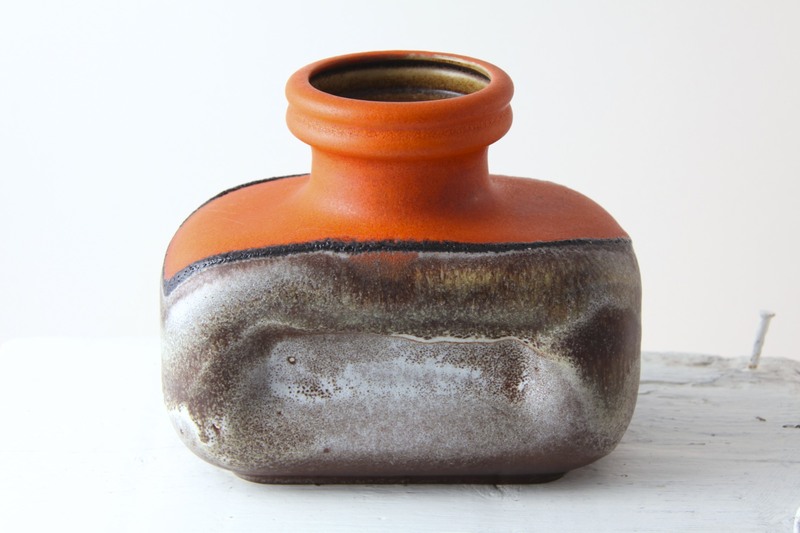 Would complement any collection of West German or European Art / Studio pottery, and would look fantastic in any retro, vintage, mid century, fifties, modernist, minimal or contemporary interior. In Excellent Condition, a couple of miniscule fleabite sized rough patches on the rims, nothing to detract on display, no chips or cracks. Marked to the base 3589 Made in Western Germany 1786 26 and with the company logo. The small vase measures 12 x 7.5 x 7cm / 4.75 x 3 x 2.75in. Marked to the base ‘Made in Western Germany 4167’. The pin dish measures 10.5 x 7 x 4cm / 4.25 x 2.75 x 1.75in. Marked to the base ‘4087 22’. This is a Beautiful Scheurich ‘Wien’ (Vienna) vase, designed by A. Seide, made in W.Germany circa early 1970’s. A Fantastic form, the ‘Wein’ series is bulb like, with its rounded bulbous base, and triple ribbed neck, reminiscent of ‘Bibendum ‘ Michelin Man’. A Striking decor, with the matte pumice like black and yellow glazes mottled and dripping down to a glossy vibrant red glaze. Flamelike with a nod to Pop Art and Space Age styles and very in keeping with the ‘Fat Lava’ designs of the era. A Colourful statement piece, sculptural in its own right, and a perfect bright retro encapsulation of the era! 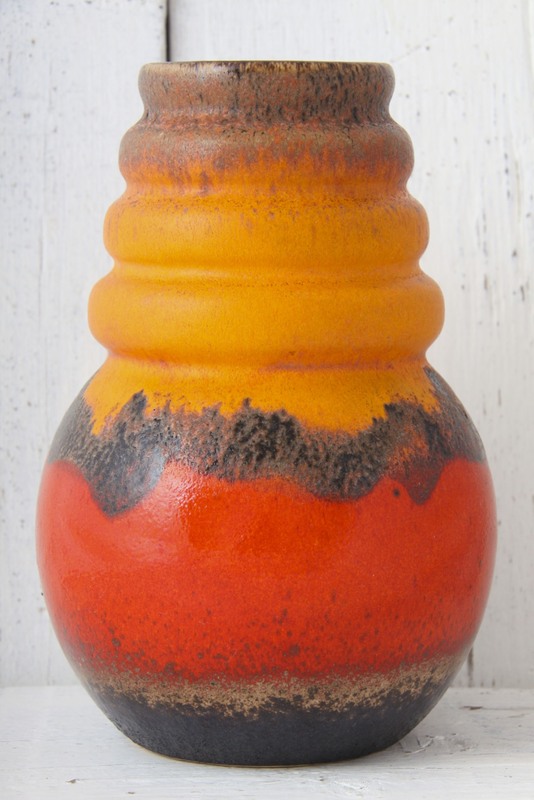 Great as an addition to any collection of Fat Lava / West German pottery, and would be a superb vase to brighten up any retro, vintage, 60’s, 70’s, pop art, space age or contemporary styled interior. Measures 23 x 15 x 15cm / 9 x 6 x 6in. 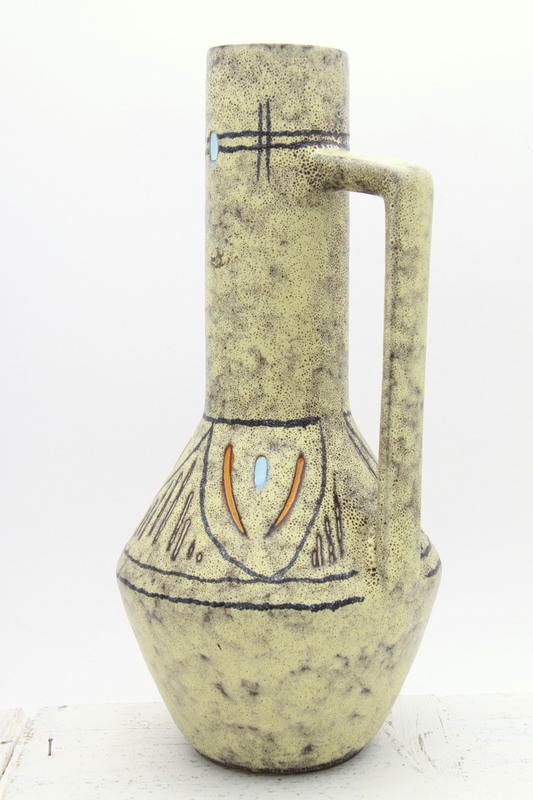 This is a Great Steuler Keramik vase, West Germany circa late 1960’s / early 70’s. 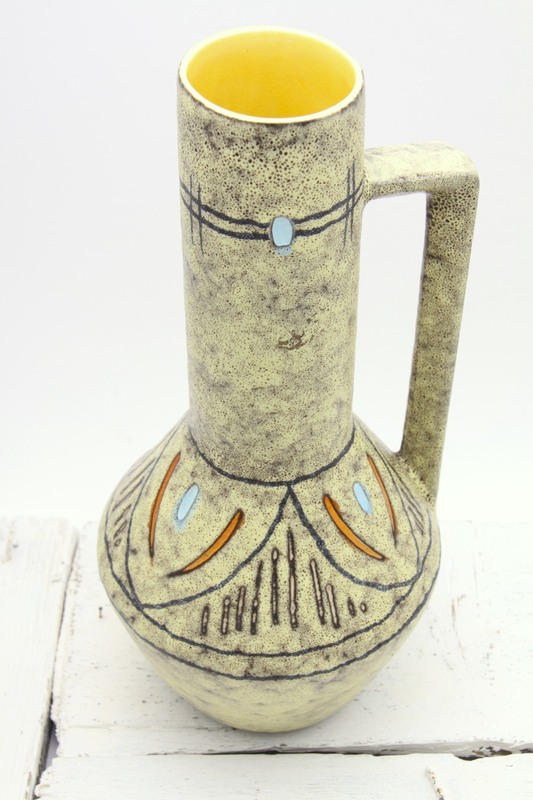 A Fantastic piece of retro West German art pottery from one of the lesser known makers. Probably designed by the renowned Cari Zalloni who created space age / optical pieces for them during this period. The vase has a squat rectangular form, rounded on all corners and with recesses to the largest sides. Topped off with a chimney-like neck and double banded rim. 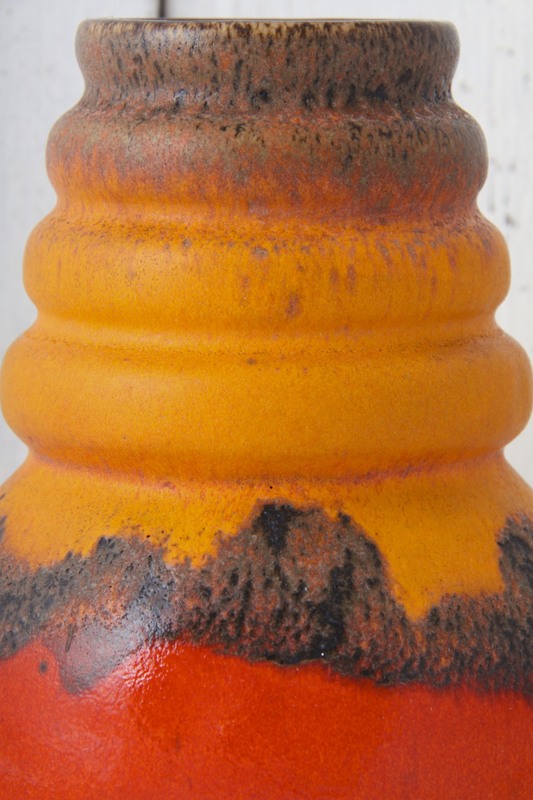 The top has a lovely vibrant matte orange glaze with a pumice texture. 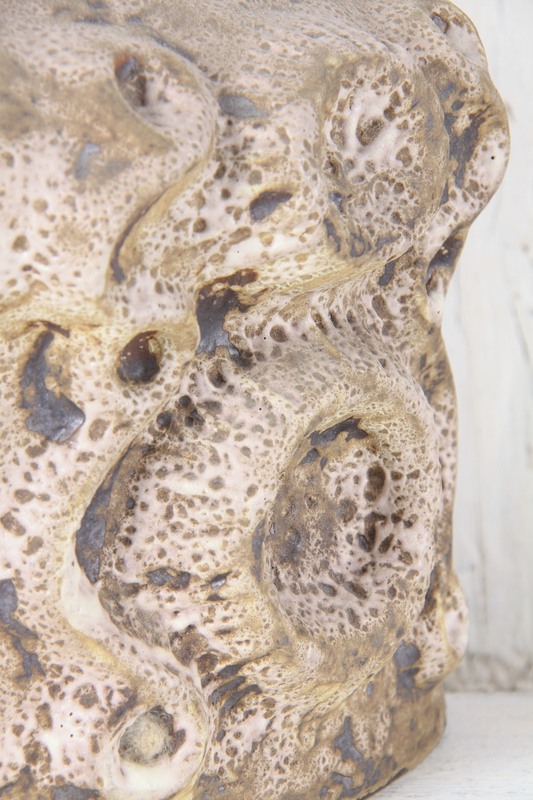 A black tube lined ‘lava’ glaze separates this from the lower earthy organic foamy drip glazes in cream and brown, with a matte pumice effect. 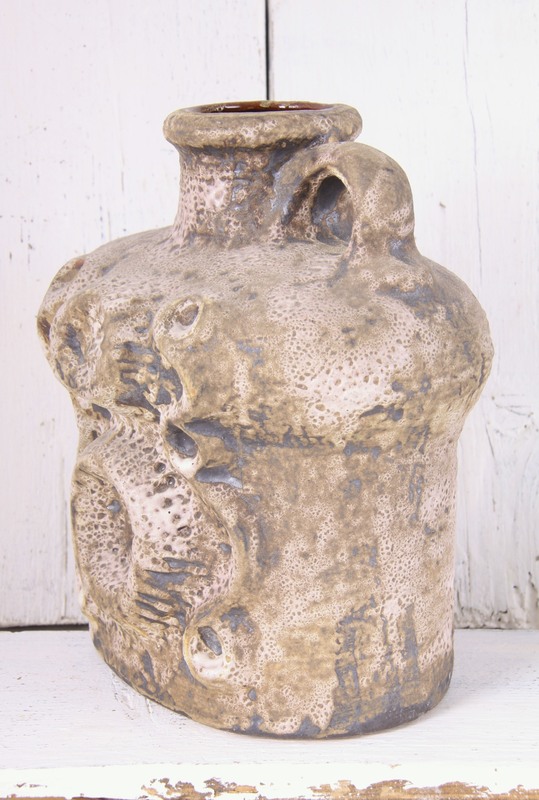 A Great addition to any collection of West German / Fat Lava / European Art Pottery, and would complement any retro, vintage, 60’s, pop art, space age, modernist, minimal or contemporary interior. In Excellent Condition, no marks, chips or scratches. 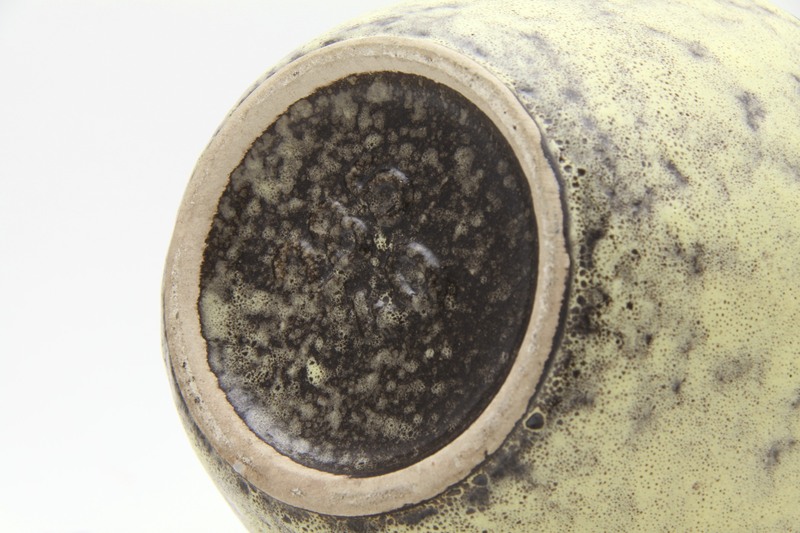 There are a few small burst bubbles of missing glaze which appear to be from production, they do not detract from the look on display. Measures 18 x 10 x 15 cm / 7 x 4 x 6in. The base has the Steuler mark and the form no. 445 / 15.